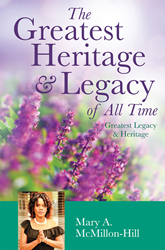 Within the pages of Mary McMillon-Hill’s new book, The Greatest Heritage and Legacy of All Time ($15.49, paperback, 9781545663356; $25.99, hardcover, 9781545664902; $7.99, ebook, 9781545663363), readers will find a book expounding on God’s words in the Bible. The author prays The Greatest Heritage and Legacy of All Time will touch and change a lot of people’s lives. She wants to let all humanity know through her testimonies that there is still power in God if we trust and believe. At this day in time, people need to hear from God through His servants’ testimonies and know God is still in control and His power still exists. She hopes to let everyone know, through the telling of her personal stories, He will never leave us nor forsake us. Mary McMillon-Hill graduated from college as Clinical Medical Nurse with a state board license and CDL license. She has many years of Secretary experience and training. Xulon Press, a division of Salem Media Group, is the world’s largest Christian self-publisher, with more than 12,000 titles published to date. The Greatest Heritage and Legacy of All Time is available online through xulonpress.com/bookstore, amazon.com, and barnesandnoble.com.